During my life I have tackled many many crafts such as leatherwork, patchwork/quilting, scrapbooking, calligraphy, porcelain doll making, knitting and quite a few others but today I had the first of my two day class on one craft I have never tried. Yes this morning it was Mosaics that was on my agenda. 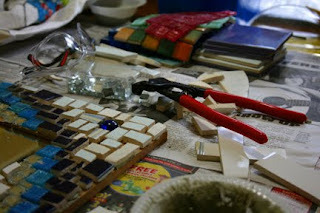 There were eight of us in the class and the frames and most of the tiles were included in the cost. I did have a little supply of tiles compliments of a girlfriend “Vicki” who works in a tile shop. I actually enjoyed it more than I expected and the tiles were much easier to work with than I thought they would be. It did get quite messy with some of the girls spraying the rest of us in tile chips as they did their cutting and trimming. So now I have my mirror half done with all the tiles adhered to the mirror frame and next Sunday morning we complete the project by doing the grouting. “Living to Learn” – I just love learning new things wether they are big or small. Today’s Mosaics experience was really fun. As some of you may have noticed from my post, I really believe we should all learn something new every day. If you can’t get to it every day then please at least every week. I hope you take a photo of your finished project Davine, it looks rather interesting. I think that I'll put the learning on hold for a while and give my brain a rest! lol Just kidding, I'm going to install a new program on my computer today, Photoplus X3 whatever that is and see if I can learn the basics of the editing in this program... if time permits this is. I love to get outdoors and "play" in the dirt while the sun is shining. Have a wonderful day and it's cool that your trying new, different things in your life.